In the occupied Crimea, participants of single pickets on October 14 are fined 10.000 rubles, QHA's source reports. In the so-called Belogorsky district court, Crimean Tatar activists Aider Abibulaev, Eldar Emir-Useinov and Ruslan Umerov were fined 10.000 rubles. The "Sovetsky District Court" ruled on the case against the activist Server Seytibramov and also fined him 10 thousand rubles. 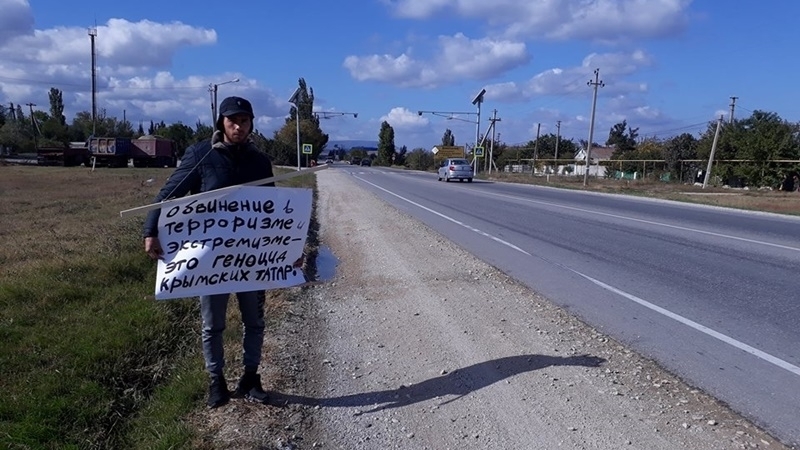 The so-called Zheleznodorozhny District Court of Simferopol fined the Crimean Tatar activist Ali Muratov 10.000 rubles for going out to single-person picket in Simferopol with the poster "Freedom of the falsely accused Muslims of Crimea". Muratov himself stated that he did not plead guilty. In the Kremlin-controlled Sudak City Court, activists Tair Ibragimov and Dzhamadin Ziyadinov were fined 10.000 rubles each. "Kyiv District Court" of Simferopol ruled on the case against activist Tair Umerov. He was fined 10 thousand rubles. December 18, the so-called "Judgment Day" is expected in Crimea. This day seventy trials are scheduled to be held against Crimean Tatars who went on single pickets throughout the peninsula, protesting against the persecution of Muslims in the Crimea. Official websites of Crimean city and district courts announced that they intend to hold 70 court hearings. In some courts, only 15 minutes were planned for consideration of each administrative case. Kyiv District Court of Simferopol: M.A. Abdurakhmanov at 11.00, V.M. Grigor at 11.05, R.S. Suleimanov at 12.00. Zheleznodorozhny District Court of Simferopol: A.M. Muratov at 9.00, E.I. Azizov at 9.30. Simferopol district court: U.S. Useinov at 9.30, R.S. Emir-Useinov at 9.30, D.T. Bekirov at 9.30, A. Chakirov. at 10.00, E.S. Kantemirov at 10.00, A.D. Suleimanov at 10.00, A.S. Aliev at 10.30, S.Sh. Mustafayev at 11.00. Belogorsky District Court: R.R. Umerov at 9.30, S.M. Muratov at 9.30, E.E. Emir-Useinov at 10.20, A.D. Abibullaev at 10.20, M.R. Mustafayev at 11.45, L.M. Bovbekov at 14.00, R.O. Naneyshvili at 14.15. Krasnogvardeysky District Court: U.M. Ablyatipov at 10.00, M.U. Ablyatipov at 11.00, S.R. Izmailov at 14.00, E.U. Ablyatipov at 14.00, A.U. Ablyatipov at 14.30, A.S. Ibrahimov at 14.30, R.A. Emiruseinov at 14.30, A.M. Ibragimov at 15.00, E.I. Ziyadinov at 3.30 pm, S.U. Ablyatipov at 15.30. Kirov district court: T. Umerov at 10.15, E.M. Ablyazizov at 10.30, D.Sh. Asanov at 10.45, R.U. Mambetov at 11.15, S.N. Yakubov at 11.40, A.A. Susanov at 12.30, Z.V. Kulametov at 13.00, R. Kurkchi at 13.30, G.Z. Kulametov at 14.40, R.A. Dzhemil-Usta at 15.30. Sudak City Court: D.M. Ziyadinov at 9.00, T.S. Ibragimov at 9.00, S.S. Seitmemetov at 9.30. Sovetsky District Court: S.S. Seitibramov at 10.30, M.F. Rasilov at 10.45, E.S. Aliev at 11.00, A.I. Seitkhalilov at 11.15, A.A. Zevriyev at 11.30, L .Ya. Seytmemetov at 13.00, S.M. Salimov at 13.15, E.S. Seit-Eminov at 13.30. Dzhankoysky District Court: N.D. Ametov at 9.00, D.E. Yunusov at 9.30, F.A. Abduramanov at 11.00, L.L. Kerimov at 11.30, E.N. Abibullaev at 13.00, R.K. Asanov at 13.30, N.S. Dervishev at 14.00, D.R. Ablaev at 14.00, E.A. Bekirov at 2.30, A.S. Ziyadinov at 2.30, A.A. Zekeryaev at 15.00, N.A. Aliev at 15.00, R.Sh. Kutuzov at 3.30 pm, L.A. Zekeryaev at 15.30, A.O. Suleimanov at 4 pm, R.I. Ametov at 4 pm, M.R. Murakhas at 16.30. Reference: October 14 a minimum of 34 people was arrested for participation in single pickets in the Crimea. In total, more than 100 people took part in the protest actions in the occupied peninsula. People went for single pickets in Simferopol, Dzhankoy, Gvardeysk, Belogorsk and other cities of the occupied peninsula. All detentions were held in violation of the Russian legislation in force on the annexed peninsula. Later, people massively received protocols, accusing them of violating the rules of holding public events. Single pickets in protocols are called unauthorized mass action. A Crimean Tatar from Belogorsk has recorded a video message in which he said that he was summoned to the police station due to participation in a single picket in the occupied peninsula. In particular, the police came to him and the acting district police officer handed the protocol of the order on violation of the RF law on holding a rally.